We all know Sasa Malaysia right? well never in my life would I be expecting them to throw a tea party for bloggers and their facebook/twitter fans! being in facebook is so exciting now, I can't believe I missed so much fun last year! (only started this year). Anyway I do hope I get to go to their blogger's tea party session. I missed out Hada Labo's and I am so sad! well I was away in Genting too. 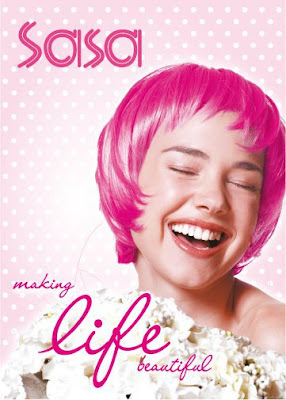 Another reason why I'm so pulled by Sasa is the tea party's theme/name called "Paint the Town Pink!" as you all know, I love pink hehe. Check out Sasa's facebook shout out below and don't forget to join in the fun! who knows we might get invited! Paint the town PINK(!) at our first ever bloggers' tea session! Nope, not gonna sell you anything, and not gonna launch anything, we just wanna get to know you better! Other than our invited blogger guests, we're also opening up TEN invites to the tea party for our fans on FB and also followers on Twitter. Interested? Yea, that's it! Application closes 2010.07.29 (Thu) @23:59 (msia time, of course^^) We will announce the lucky winners for the TEN INVITES on friday (2010.07.30), good luck!